The Alberta government’s international trade missions helped attract millions of dollars in new business and investment to the province this year. Minister Bilous and stakeholders highlight the importance of international trade missions. From April to November 2017, Economic Development and Trade led five ministerial missions and 49 business delegations with nearly 400 local companies. While the missions will have additional impact in the new year, companies have reported at least $502,066,700 in actual trade and investment since April 2017, contributing to a dramatic increase in trade this year. In the first ten months of 2017 Alberta exports were $82.7 billion, up from $63.1 billion during the same period last year. The 31 per cent increase accounted for 64 per cent of Canada’s entire trade increase during that time. Alberta international missions included bringing hundreds of Alberta businesses to global industry trade shows where they met with hundreds more potential international buyers and investors, facilitating a variety of direct business-to-business meetings, supporting business owners as they gather market information in new countries, and government-to-government meetings to strengthen cooperation to increase trade. Results included new product and service sales and contracts, increased market access through memoranda of understanding and sister-province relationships, business-to-business partnerships and agreements to collaborate. Al Duerr, CEO of General Magnetic International Inc.
Trade missions are crucial to securing and increasing market access for Alberta companies by demonstrating the province’s commitment to enhancing existing international relationships, especially those with trade agreements. Ministerial visits support government-to-government relations which boost investor confidence in the province. Missions are also an opportunity to showcase Alberta in the international marketplace and highlight why it’s the best place to do business. www.investalberta.ca to learn more about participating in Alberta trade missions. www.jobsplan.alberta.ca to apply for funding that helps export-ready companies access new international markets. Met with British parliamentarians to acknowledge and maintain the strong relationship between Alberta and the U.K. throughout the Brexit process. Signed the Alberta-Bavaria Memorandum of Understanding to support research and innovation collaboration. Signed an MOU with the European Bank for Reconstruction and Development to support projects that help Ukraine develop and strengthen its banking and energy sectors and energy security. Renewed sister-province relationship MOUs with Ivano-Frankivsk Oblast and Lviv Oblast in Ukraine. Witnessed the signing of the partnership between the University of Alberta and the Fraunhofer Society to jointly develop and commercialize new energy technologies. Raised the profile of the Alberta energy, cleantech and environmental sectors under the Canada­European Union Comprehensive Economic and Trade Agreement and the Canada-Ukraine Free Trade Agreement. Five agreements signed between Alberta companies and local partners to gain market access into the Gulf Cooperation Council (GCC) region. GCC member states include Bahrain, Kuwait, Oman, Qatar, Saudi Arabia and the United Arab Emirates. Closure of $1.5 million in sales for Alberta companies. Developed relationships through government-to-government interaction, resulting in more than $6 million requests for quotations in the GCC region. Met and built relationships with government officials from the GCC region and Egypt. Showcased Alberta expertise and technology in the energy sector to global industry leaders. 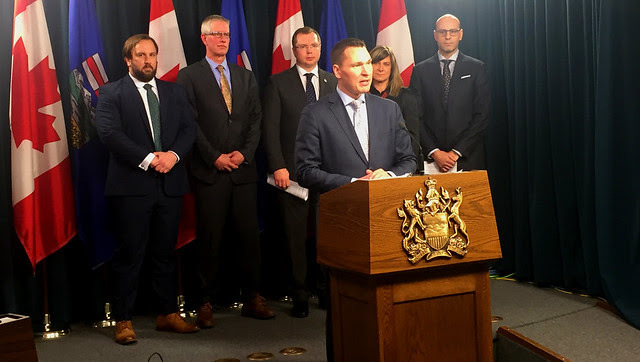 Tags: Alberta exports, invest Alberta, Jobs Plan Alberta, Minister Deron Bilous, trade. Bookmark the permalink.